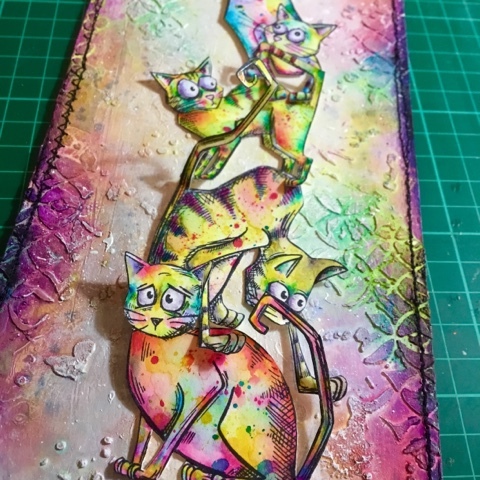 Welcome to our Friday guest day and we have the most amazing lady and post for you with her wonderful crazy cats. 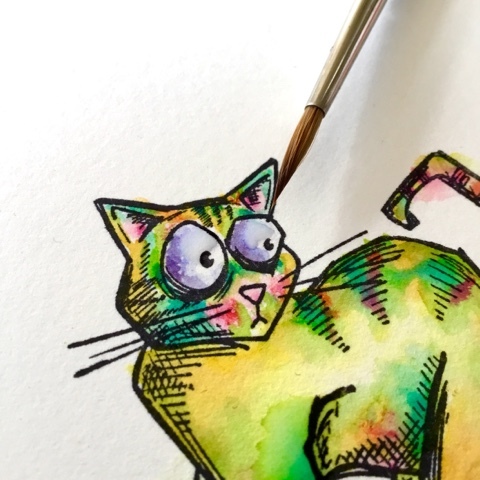 Now I have to admit they are not the most endearing of creatures to me but Karen makes them look fun, adorable, enchanting and downright cheeky in the way she colours and displays them. You are just gonna be amazed at this wonderful project and post so pick up a cuppa and take a look. I live with my hubby, beautiful 16 year old daughter Chloe (who is my world btw - and she knows it hahaha - I'm a soft touch!) And what we call our babies, the furry gang of 3 dogs, 1 oh soooo sweet and ruined pug called Sammy and 2 giant breed Leonbergers, Leo and Ruby. Ruby has to always help me create, shes forever gotten bright acrylic paint on her tail and especially her big wet nose!!! Creative wise, I have no boundaries, I'm a free bird, organic and spontaneous, my desk is always messy whilst creating but I have to tidy up in between for sure or I'd go mad! And on the mad note yup thats me, creating sends me hyper so the tv has to be on to level me out, I'm currently watching 'Breaking Bad' whilst creating with copious amounts of Yorkshire tea and a lot of movement hahaha! need to loose some of the winter pounds I've piled back on! And my hands, nails are forever plastered in paint, I hate how it feels, tis a means to an end, I go thro' millions of wet wipes!!! 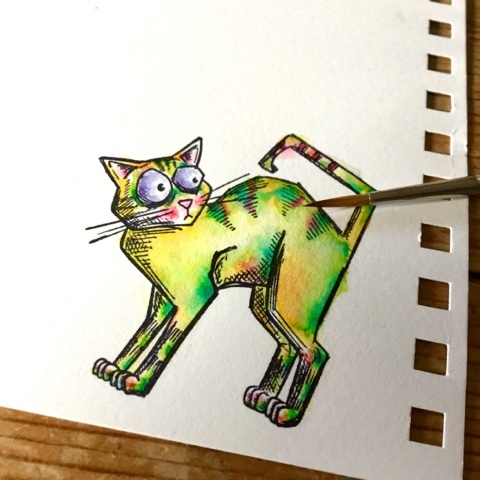 I stamp out the cat with Ranger Ink Black Archival ink onto the smooth side of a Watercolor paper. Let the ink totally dry then proceed to wet the cat down with water in the area I'm about to start to ink! 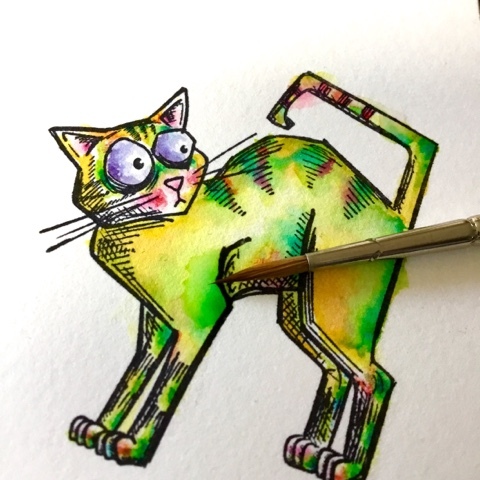 Here I've used a light base color to start to build the layers of my cat, always start from light to dark with inks as the lights allow layering of colors over them and lets the other various colours shine through. 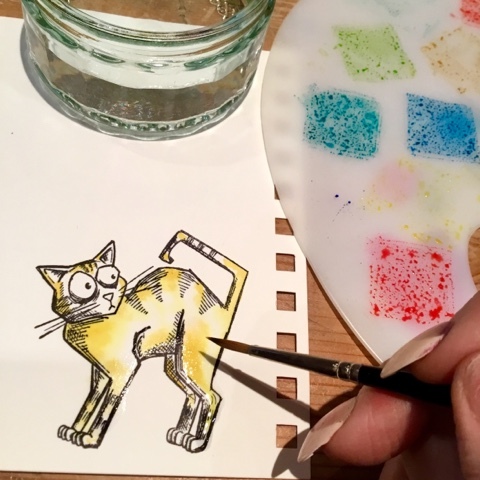 I went for Mustard Seed, Squeezed Lemonade and Fossilised Amber and in turn starting with the lightest ink (Squeezed Lemonade) I repeatedly dab a little ink int the pre-damped paper. As I fill an area, I damp the next and repeat, as you get faster you can basically dampen the whole cat, just dampening again where necessary. 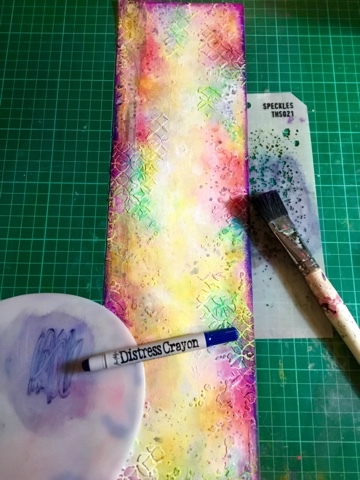 If you get too many puddles of water the corner of a kitchen roll soaks up the excess, you can also use kitchen roll to soak up a color of ink that's just not doing it for you! You can see I leave white space - 'Spectacular/Primary Light, where I can I like to leave spectacular white space for my hi-lights cos nothing beats it, not a white marker pen or paint but they come a close 2nd! And I always leave a bigger area than I think I need as it always disappears somehow! The eyes, toes, nose, inner ears etc will be a different color therefore leave as spectacular too. Now If necessary I dampen down where I'm about to dab the Twisted Citron ink, if it's spreading into an area you don't want it to go - remember the corner of the kitchen roll trick, soak it up quick. 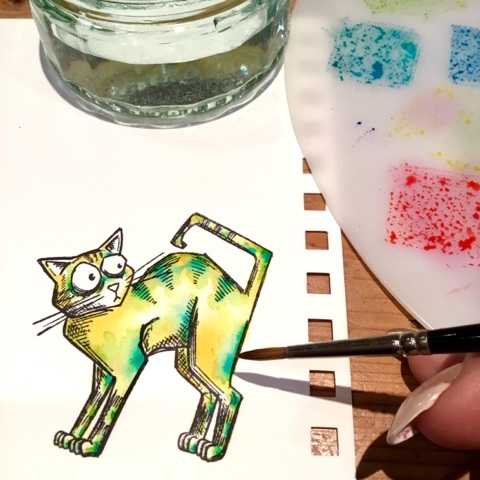 Here you can see the color Mermaid Lagoon making the cat come to life, but be careful to only add a little as this vibrant color will cover over all the yellows and greens if you are not careful - little and often is best, it's easy to add but harder to takeaway with the stronger and more vibrant colours, this applies to the darker shades too. Worn Lipstick, Picked Raspberry make for great rosy cheeky cheeks, I'm careful that I only dampen down the ear/cheek are slightly and only where I want the color, I basically am very precise! The belly area is colorised on the 'yellow' part as as we all know if you mix the red and green you get that beautiful shade of 'mud'. The eyes are colored with Shaded Lilac, remember to leave white/spectacular space. Here I'm topping up the various pinky areas, again hardly if any at all pre-damping down required. The shades of Worn Lipstick, Picked Raspberry are used again alongside Abandoned Coral and Ripe Persimmon always remembering not to go mad with the bright colors, little and often! I even puddle the eyes - carefully of course. More layers! 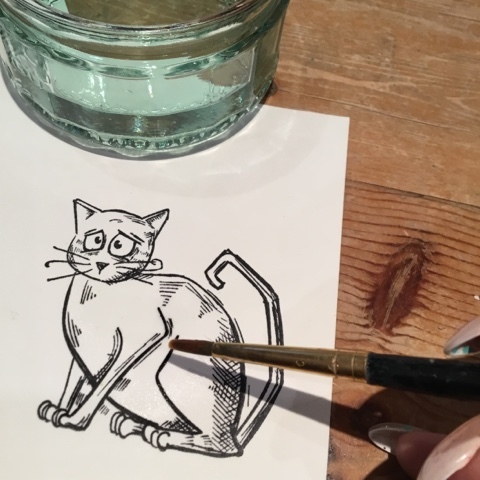 When everything is totally dry, grab a dry brush and pick up a minute amount of ink, wipe most of the ink off on kitchen roll, then as I am here with the Worn Lipstick shade dry brush the ink on your cat, this leaves a lovely 'f'uzzy' look! Heeheehee splatter or as I call it 'Splatoon' time. Cover up that precious face, add clean water to your inks and in turn pick up the watered down ink (I always practise first to see if the brush I'm using is giving me the kinda splats i want and that the colour isn't too watered down) The tapping of the end of the brush is great if you want more control or simply aim your brush at the cat and move your hand in a 'whip like' manner - again practise makes perfect heeheehee! 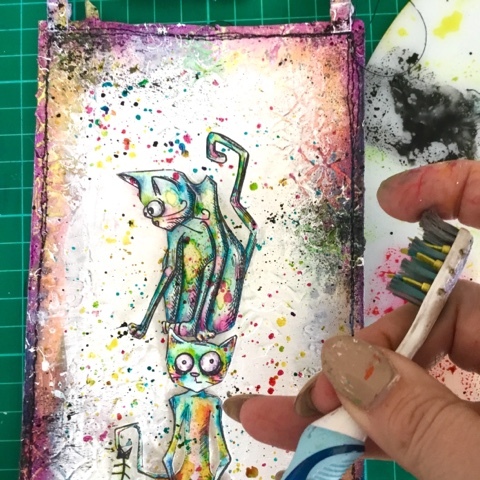 I actually use both these methods.Let each splattered color dry before starting on the next and as before you need less of the vibrant etc. colors. 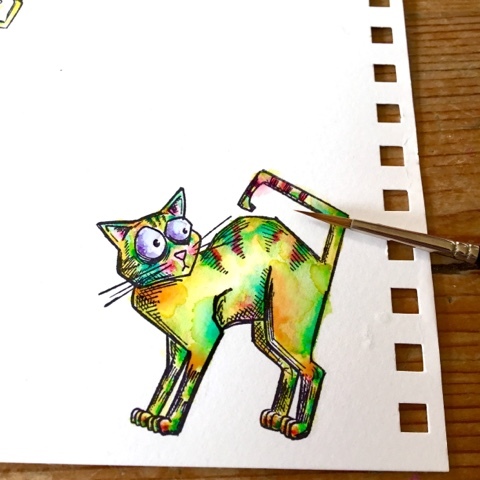 The color variations are endless with Tim's amazing colorwheel of distress inks - eeeeek! An 'unimaginable' kaleidoscope of stacked crazy cats! Now for the Hanger, gesso was painted onto card stock, I randomly applied the new 'Dapper' design tape and oh so glittery deco tape, then clear gesso'd everything to seal the tape securely. 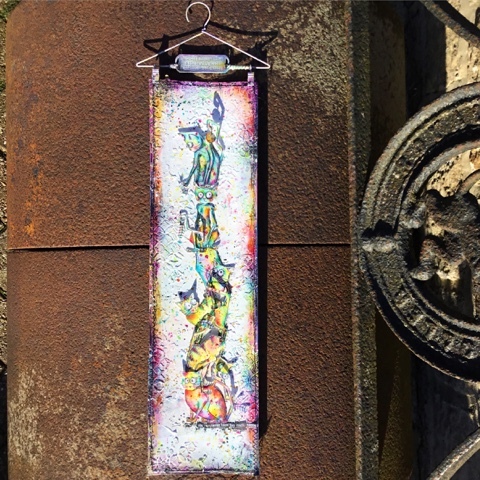 Tim's mini stencils are a fav of mine as they give the tiny detail I always crave, swoon! 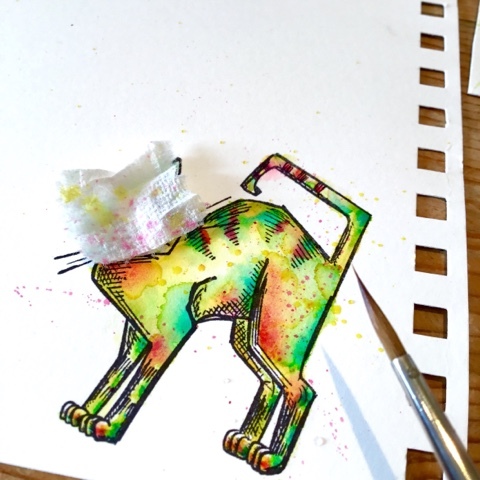 Ranger Ink's texture paste has a super soft, smooth 'marshmallowy' feel, glides like butter over Tim's stencils, if you ever struggle with texture paste, this is your answer, tis not gritty and gets into all the nooks and crannies! 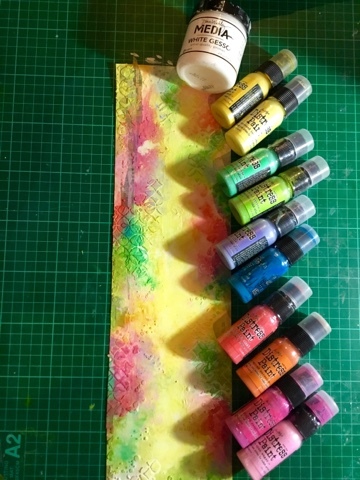 So here's the distress paint line-up hahaha - Spun Sugar, Picked Raspberry, Spiced Marmalade, Abandoned Coral, Mermaid lagoon, Shaded Lilac, Twisted Citron, Cracked Pistachio, Squeezed Lemonade and Mustard Seed. 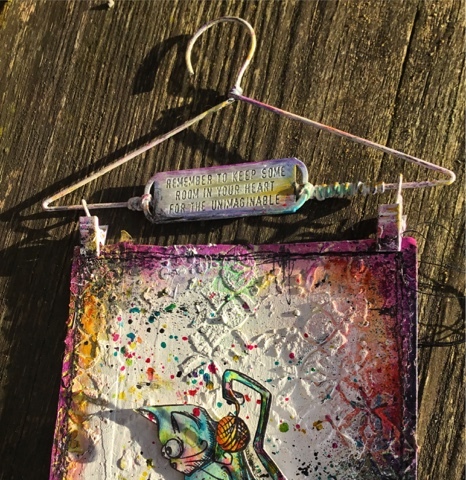 Spritz the hanger till its fully wet but not puddling with water, and start to dab on the colors either with the dabber or your fingertips, where the colors start to meet they will merge into each other, be careful where opposite colors meet as they turn a nasty shade of 'mud' if this happens simply wipe off the mud with a wet wipe! Once everything is dry Tone down and blend the colors with Spun Sugar and Gesso - fingertips are best for this and a wet wipe helps too! 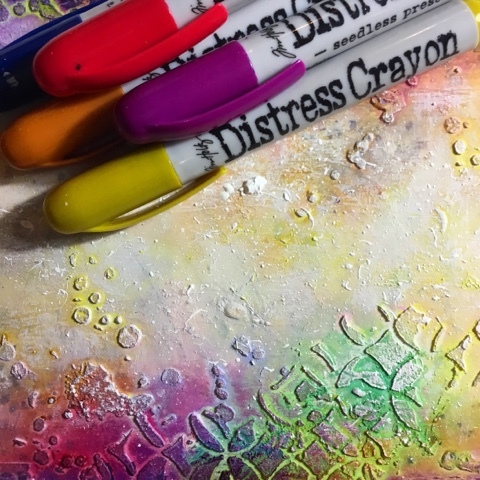 Once dry I can add these new magical Distress Crayons eeeeek! 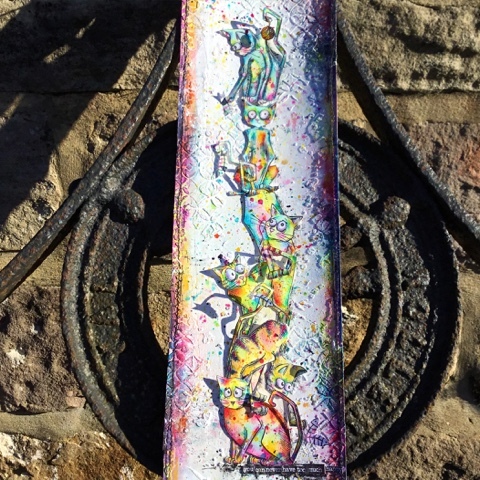 They add more depth and layer perfectly over paint, distress heaven, with water they spread out and move more, you can journal over the top of them, stamp over the top of them, they are just LUSH! And lol wipe off your fingertips straight away! 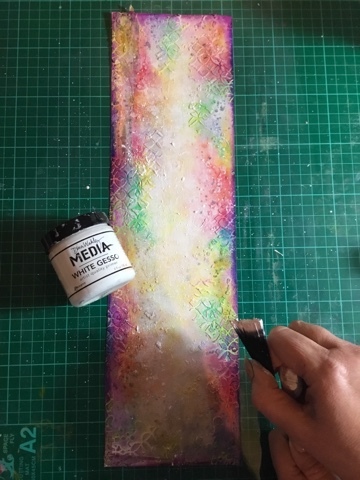 So I added extra laters with the crayons round the edges, just take the crayon scribble a little of the color you want to build up over your paint, then with your fingertip quickly blend into the paint, you can layer your colours too and if you don't like wot you see wipe away with a wet wipe! 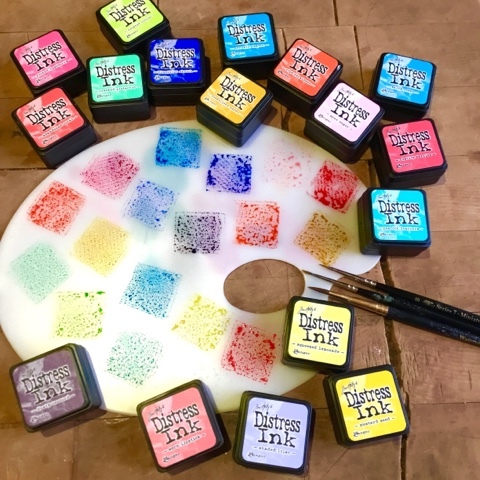 How lush do Tim's Distress Crayons look over his Distress Paints! 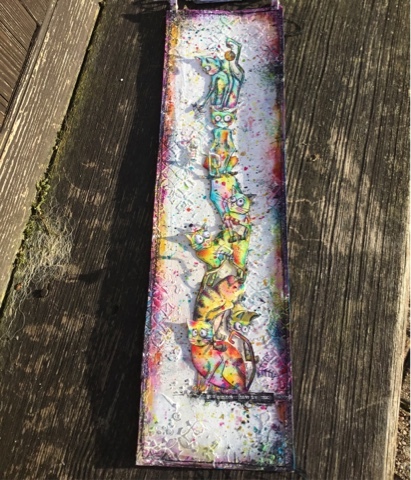 I even scribbled some crayon direct onto my palette, picked the color up with the end of a dry firm/springy headed paint brush and stippled through a layering stencil for a subtle end result. Ha! one of my fav bits! 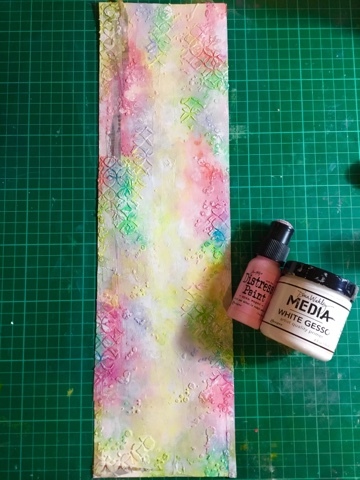 When ever I can I try to get this Tim Holtz Splatter Brush out - makes me so very happy and is always a big hit in my workshops. 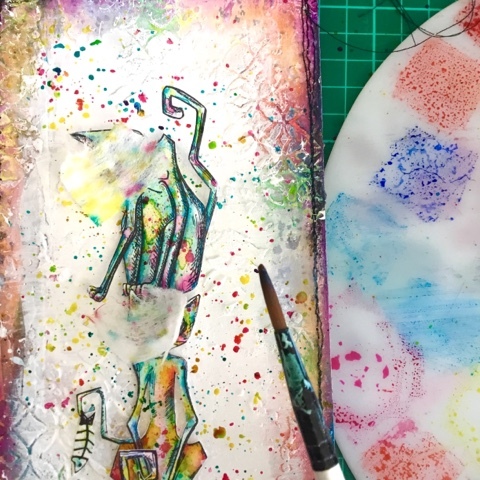 Here I have used thick white gesso so you get thick blobs and splats and even great streaks of gesso - such FUN! 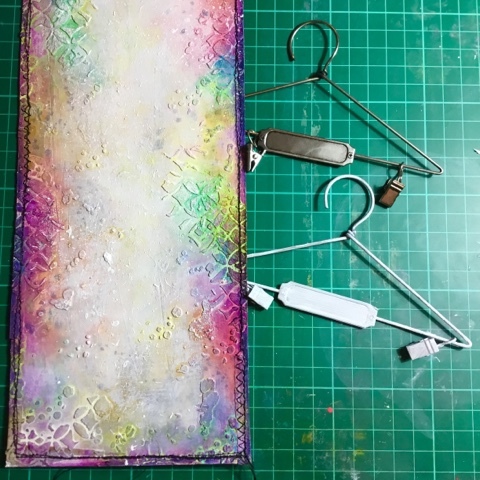 I coat the Display Hanger with gesso a couple of times. How cute are these hangers! And can you spy I've gotten my old Singer sewing machine out, leaving the loose end hanging after stitching around the edges a couple of times with various stitches. 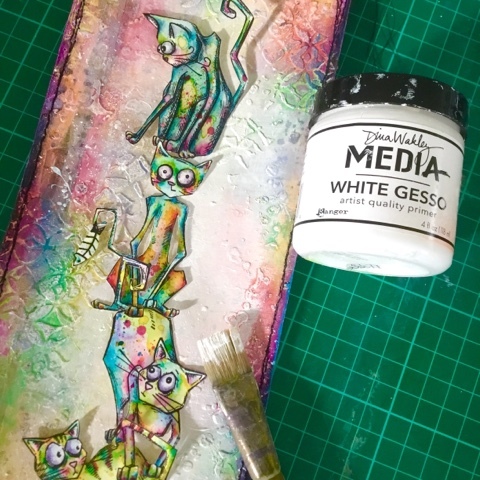 So when it comes to adhering the cats I do a trial run to get them sat where I want them, I use 3d glue so they sit proud of the background. I told you I was organic and spontaneous didn't I - here's an example of it, the background was just too busy for the cats, I kept looking at it and thinking how/what? 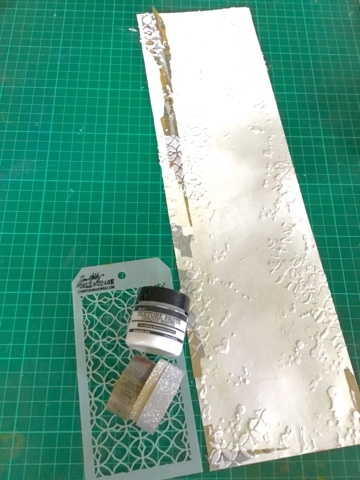 I went to bed to sleep on it and with a fresh pair of eyes the next morning the answer was to gesso in an around the cats, only use a little gesso pulling the gesso softly out towards the edges (approx 1cm of the edges peeped through) When dry I repeat the gessoing but only the middle areas. Now when everything is dry add more of the distress ink splats, cover them faces again, I even used Black Soot for a few splats - only a few black spots but they make a huge difference, thay make everything 'PoP' ansd sing! 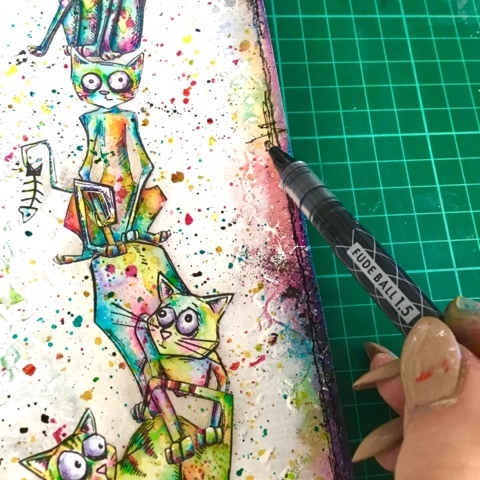 I stamped and cut out the fish and ball of wool, colorised with the crayons and adhered to fun places ie the tails or paws - I love it when the cats eyes look longingly at them teehee! I also chose one of the quotes from Tim's new Idea-ology Small Talk Occasions pad, I like to cut the words up seperate and all different sizes. 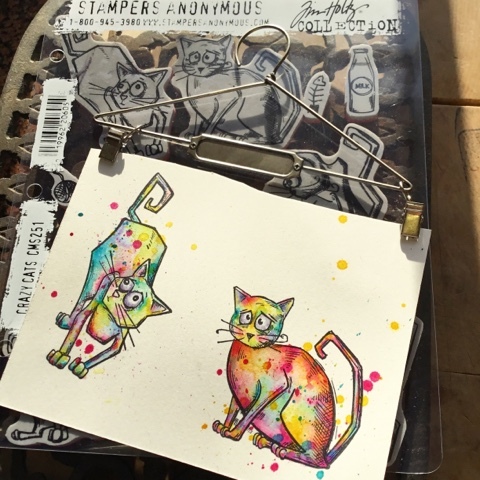 I used a black Stabilo All Pencil to shade in/under/around the right hand side of the cats for extra definition and make them jump off the hanger. 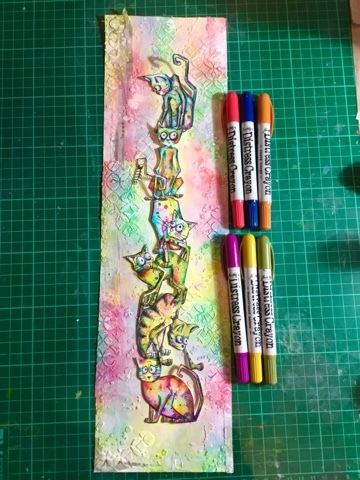 I lightly gesso'd a Quote Band and after it dried I added the Distress crayons, rubbing in with my fingertips, I kept layering the colors and blending, the hanger was colorised like this too. I attached the Quote Band with white wire and colorised the wire too - this crayon business is addictive!!! The cat I finally decided on for the bottom of the stack was simply cos his eyes said it all!!! 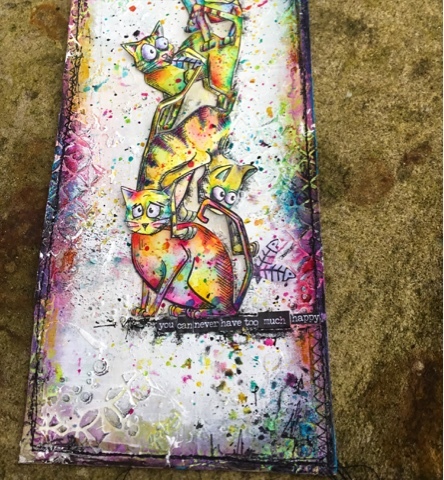 So I hope you enjoyed my visit - I sure did, i would loooooves to see any of your creations that I may have inspired you to create - go pop them on my fb page - I looooooves it when we all share our art - I call my art 'HAPPY ART' I hope this crazy cat inspired piece has made you smile and happy! Well what did I tell you? Aren't you just so fired up you want to get out those inks and get going? 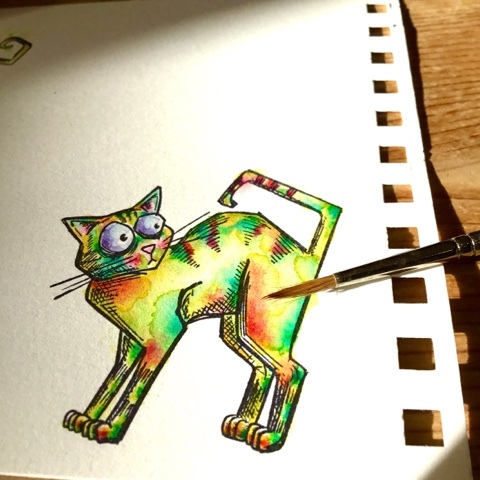 Don't you want to stamp and colour and play to your hearts content? I know I do. Wow what a fabulous tutorial and beautiful photos every step of the way Karen. You have done an amazing job of sharing your inimitable talent and taken us to a place of wanting to see more and more and to have a go for ourselves. 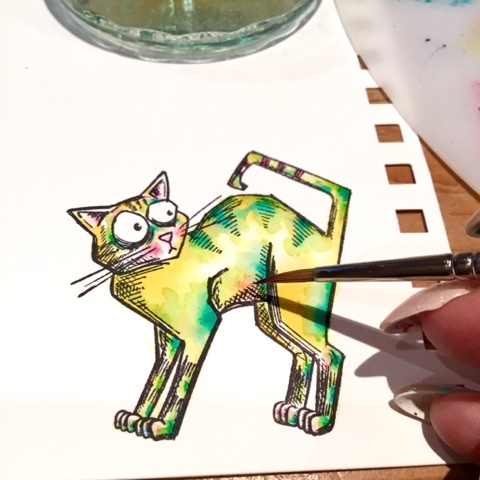 This post will be pinned on our Pinterest Guest board but I know I will be pinning it and bookmarking it so I can keep coming back to refresh my memory and learn how to colour these crazy animals. Thank you so much for haring a part of our Vintage Journey with us with these delightful animals. We have one more Destination Inspiration post coming up next Monday and then the following Friday will be our 2nd birthday and just to let you know things are a'changing. So please visit us to find out more. In the mean time let's get some colouring in and enjoy the weekend. Fab tutorial - I just want to take the day of work and play colour! 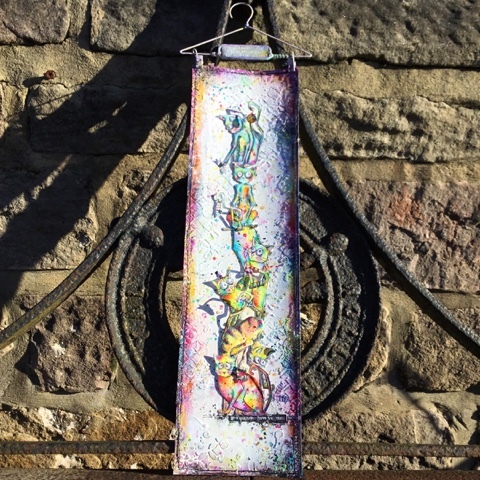 Gorgeous hanging cats... well you know what I mean!! Yay Karen, great to see you here!! I think Brenda has said it all already in her final words here, your work is incredible!!!! And what a superb tutorial! The detail you bring to your work is what puts it into a league of its own, - a brilliant and inspiring piece!! (And this comes from someone who actually is no fan at all of either crazy birds or cats....)but a huge fan of your work!!! Welcome Karen. Tis so lovely to have you here sharing your talent . 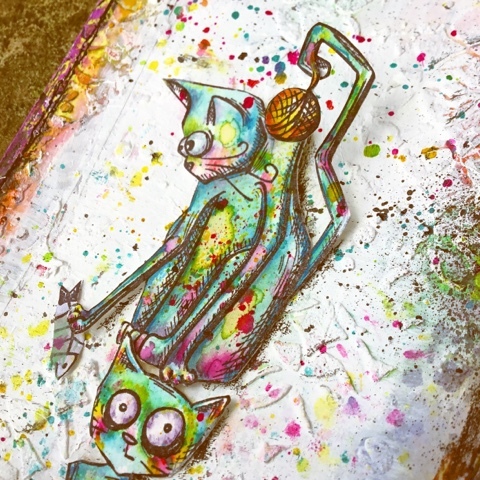 A wonderful quirky crazy cat assemblage and tutorial . Always admire your clever use of those vibrant colours and I love that you fly freely with your art . Kassa, I hereby dub thee Queen of Color! AMAZING tute and now I have to go give it a go and see how I do! Wow Karen. Such a stunning piece of work and great tutorial! 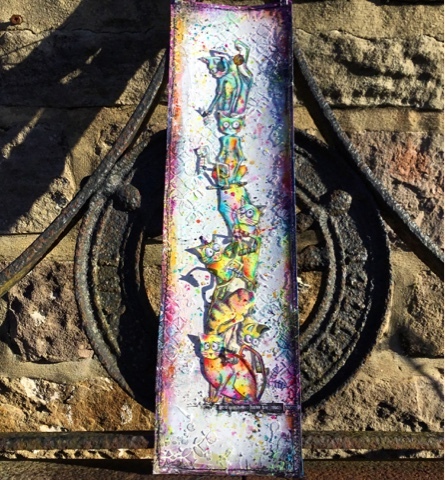 Wow Kassa what an amazing colourful project, thanks for sharing with us all at AVJ. 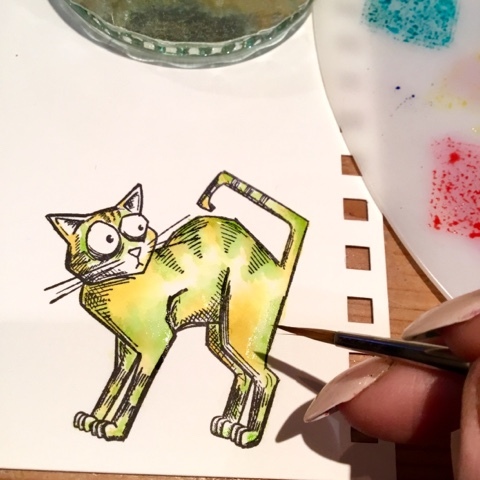 Fabulous color and real crazy cats! Inspiring post with so many wonderful techniques. I love the way you create! 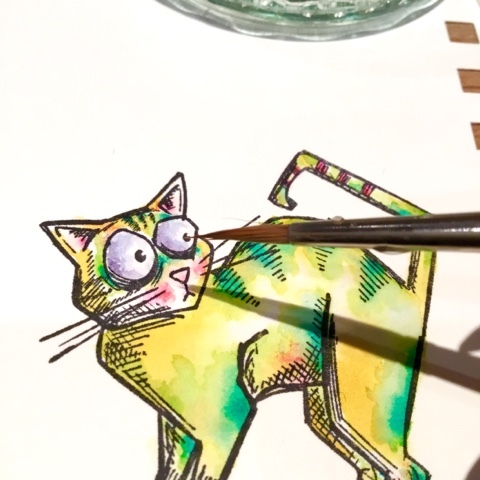 Drumming my fingers here waiting patiently for my crayons and cats to arrive! Fantastic - I loved every second of this - I am going to look at it again and again and again and .............wait for it - Again! Great tutorial Kassa I smiled all the way through, I work in much the same messy way lol, also my Golden Retriever was always covered in paint or glitter or bits of tape stuck to her fur. Great hanging full f fun and colour. Kassa, your coloring is phenomenal! This is one amazing project! Congrats on your feature, you knocked it out of the park! Your work is marvelous and you are so fun! Glad I found you.